Stone Mountain Park features two beautiful championship 18-hole golf courses complete with a pro shop and full service restaurant. 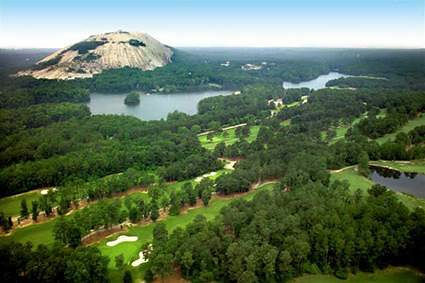 The courses offer scenic views of historic Stone Mountain and Stone Mountain Lake. The Stonemont Course at Stone Mountain Golf Club has played host to numerous national, professional events as well as Georgia amateur championships. The course is laid out over gently rolling and cantered fairways of premier Bermuda grass and greens of immaculate bent grass. Enjoy a relaxing game of par 70 layout stretching 6,863 yards. Tee up at the Lakemont Course featuring incredible views of Stone Mountain and the lake. The front 9 holes of this course wind around Stone Mountain Lake, with six holes having water in play. The back 9 offers beautiful holes with rock outcroppings and four holes where water comes into play. Stone Mountain Park’s gold courses offer a unique ambience that appeals to every golfer.